The vessel sink was as expected and installed easily. I would recommend this product. 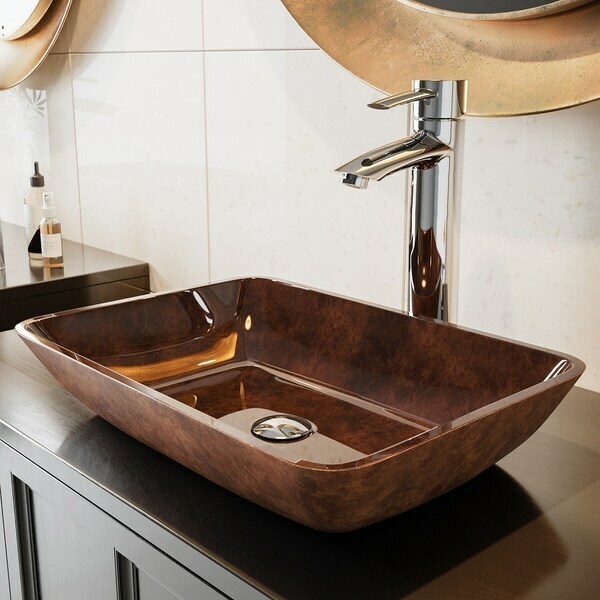 Solid tempered glass construction makes the handmade VIGO 18 inches Rectangular Russet Glass Vessel Bathroom Sink ideal for everyday use, while its unique angled shape makes it a modern update to your home. The polished interior and textured exterior are stain-resistant and easy to clean. The rich russet hues of the sink create a pretty sheen with an earthy and inviting effect - the perfect centerpiece for your bathroom. Dimensions 17.88 In. X 13.0 In. X 4.0 In. Would give this five stars but the first one arrived broken. Be sure to order the VIGO drain assembly because the one that came with the facet I purchased at Home Depot did not fit the hole size. I purchased two of these sinks and they are gorgeous. The glass is extra thick and the sink is well made. Both sinks were packaged in separate boxes and arrived with no damage. I would recommend this sink and can't wait to have them installed. This vessel sink is stunning! I am elated with this purchase. The picture does not display the true beauty of the various colors of the sink. I would highly recommend this vessel if you are looking for a unique addition to your bathroom that will leave your friends speechless. Remodeling my bathroom can’t wait to install.Love the color! "Does this sink require a mounting ring underneath it?" "what is base size, not outside demention"
The base size for this sink is 14 inches x 9 inches.